Here are the results of my first real dyepot of the year, using the trimmings from the Phaeolus cluster that I mentioned in my last post. 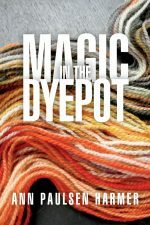 This year I’m going to concentrate on dyeing unspun fibre so I can play with the colours as I spin yarn with them. 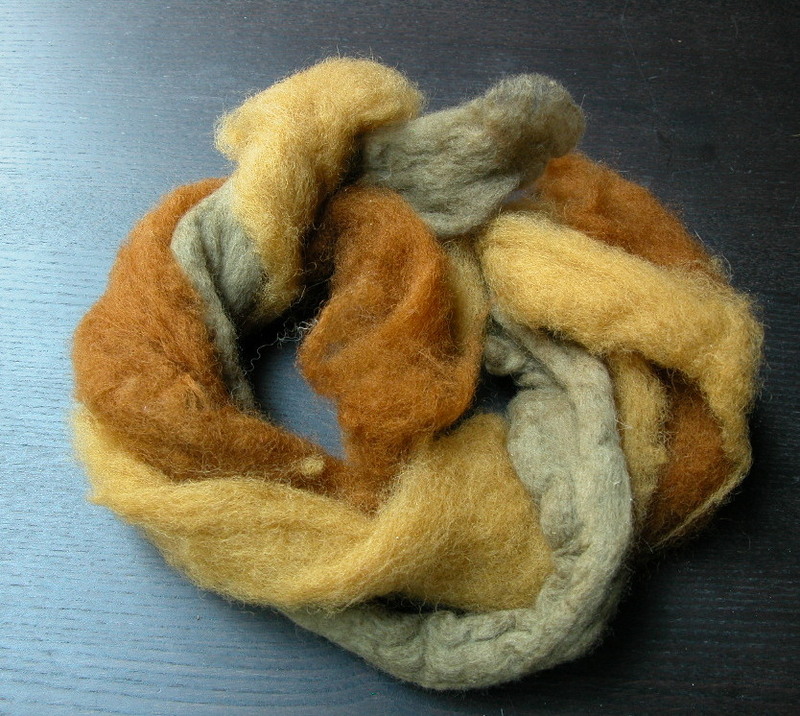 The gold roving was mordanted with alum, the green with iron and the rich brown with copper. I tried putting some more wool through the same dyebath, but the colours were lacklustre, to say the least. But I love what I got from this dyepot! Do you always dry your mushrooms before dyeing? It depends on the mushroom. I like to get fresh Dyer’s polypore into the dyepot as soon as I can, to get the brilliant golds. Sulfur tufts (Hypholoma naematoloma) also seem to give better colour when fresh – the older ones tend to lose the clear yellow. Once I cooked up a pot of fresh sulfur tufts, intending to keep it for a dye workshop two weeks later, and in those two weeks the yellow faded to a dull brown. With lobster mushrooms (still waiting for those to appear), I pare the orange skin and leave it to dry until I have enough for a dyepot. Same with the dermocybes (Cortinarius semisanguineus and cousins), but that’s because I like to collect a lot so I can have a big, bright dyepot. I’m going to try drying then freezing some this year, to see what happens. Right now I have a big box of Velvet pax (Tapinella atrotomentosa) drying next to the fireplace, and I’m going to try freezing some of them, too. Another reason to use dried mushrooms is so you can be more precise about the ratio of dyestuff to fibre, particularly if you want to repeat the results. I’m not that precise, however, and since the results seem to be so variable in any case, I have more fun playing with whatever comes out of the dyepot! These are really beautiful. We dyed fiber this weekend; black trumpets with copper mordant for green, chaga with tin for a gold. Lobster mushrooms (used the whole mushroom) with no mordant. I’m still amazed at the green from the black trumpets; I was completely certain it was just going to be gray. Here in the Northeast, the seasons almost at an end; hard frost will be here any day now. And the mushrooms on the forest floor are hiding in the falling leaves. But hopefully, a few more jaunts looking for corts and trumpets. I had to look up chaga – I’ve never heard the name before. What kind of tree does it grow on? The part you find is a canker for storing energy, I’ve never seen the fruiting body, and wouldn’t know what it looks like. They can require an axe or saw to harvest; they’re parasites, so harvesting them may be of benefit to the tree. Often, they’ll grow up the tree a bit, at the base of the crown, and the temptation to harvest leads to sawing from below, with the potential of a five-pound chunk of wood to fall on you head. We’ll be dyeing at the fair this weekend, i’ll try to get pictures.